Yes, it’s true. Lullaby – the second book in the Watersong series – is available now. The first print run is signed (as I mentioned in this post: here), so that’s pretty cool, too. 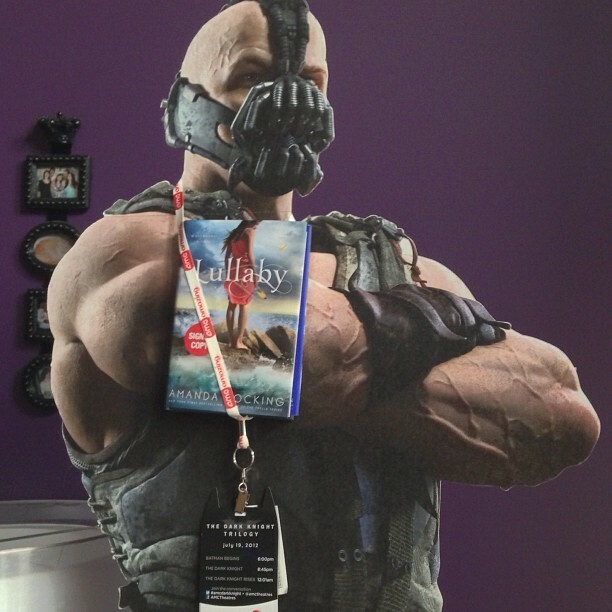 My life-size cardboard cutout of Bane is showing off the fact that his bicep is as large as my book. I’m also going to be doing some giveaways and other fun things over the next couple weeks, so keep an eye out. Right now I’m doing a giveaway on a Twitter, so be sure to enter if you’re following me there. If you don’t have Twitter, fret not, I’ll be doing more things on my blog and on Facebook. If you’re interested in getting Lullaby, go: here for all the links and places to get in ebook or hardcover. The first chapter of Lullaby is available to read: here, (and here’s the first chapter for Wake if you haven’t read that yet). You can also check out the soundtrack for Lullaby: here. And if you’ve already Lullaby and are chomping at the bit for the next book, Tidal (which I know some of you speed-readers are), don’t forget to check out Forgotten Lyrics – the short story prequel to the Watersong series. It actually hints at a few things that are going to happen to in Tidal, but if you haven’t read Lullaby or Wake, the story still works as a stand-alone. So that’s all my stuff for today. But I’ll be working on a vlog, some more giveaways, and a few other things over the next few weeks. Also, don’t forget to check out Lawless, starring Tom Hardy, Guy Pearce, and Gary Oldman, out on DVD, Bluray, and Vudu.